Meg Davenport is living proof that money does not equal happiness. Ensconced in an exclusive boarding school among New York’s elite, Meg has all the comforts money can buy. Unfortunately for her (as the Beatles would point out some eighty years later) money “can’t buy me love” and that’s the one thing Meg longs for. Specifically, love from her absent father, whose visits are few and far between. As a young lady of means in the 1880s, the only sensible career option for Meg is a good marriage. But then Meg’s father dies and she learns the shocking truth: John Davenport may have been a highly successful businessman, but his business was crime. Freed from the restraints of polite society by this news, Meg jumps at the chance to ditch her fancy boarding school and dive headlong into a life of crime. (There’s a definite thread of “nature over nurture” here as Meg seizes on the memory of every schoolgirl misdemeanor as proof positive she’s a born criminal.) Meg’s sudden lifestyle change comes as a shock to her father’s former protégé, Ian Maguire. He’s got his hands full trying to wrest control of the gang from a rival baddie, but still wants to protect the girl he’s had a crush on for years. Meg resents Ian as the rival for her late father’s affections, but is so eager to prove she’s a natural-born thief she offers up a schoolmate’s family, and their fabled stash of gold bars, as bait. And then things start to get interesting.... Actually, the premise of this story is so clever it’s interesting from the get-go. From the moment we meet Meg it’s clear she’s no ordinary schoolgirl, but then no one in this book is particularly ordinary. The family of con artists, hired muscle, and thieves who make up Ian’s gang and that of his rivals are a delightful contrast to their mark, the aristocratic, God-fearing Pemberton family. They are not your typical high society flibbertigibbets, either. Then there’s Meg’s father’s fiancée, Kate (or Lady Kate, depending on who she decides to be that day). A (mostly) reformed con artist who found God, she is a woman of many talents. Fortunately for Meg, Kate is determined to use those talents to help her almost-stepdaughter see the light. With balls to attend, suitors to flirt with, and gold to steal—if she can find it—Meg has a lot on her plate. Then there’s her inconvenient attraction to Ian and an uncomfortable suspicion that a life of crime may not be as much fun as she first thought. Before it’s all over, Meg will learn God’s grace is still available to thieves and it’s something she’ll need to give as well as receive. While Maureen Lang’s prose can occasionally be a bit heavy, this is a decidedly easier (and much more fun) read than her recent Great War novel, Springtime of the Spirit. 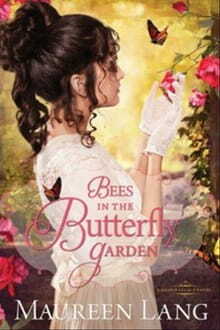 Bees in the Butterfly Garden should appeal to cozy mystery fans and historical romance readers alike. The first of Lang’s “Gilded Age” novels, it’s a very promising start to the series.